One of the things that I do, and have done all of my life, is look at backgrounds. That is, everything in view except what you're really supposed to be looking at. I look at mountains, clouds, buildings, that sort of thing. And I can really appreciate this strange behavior of mine when people wonder what I'm looking at? Take the image above, for example. What do you see? If you're like most normal people, you will see a billboard. 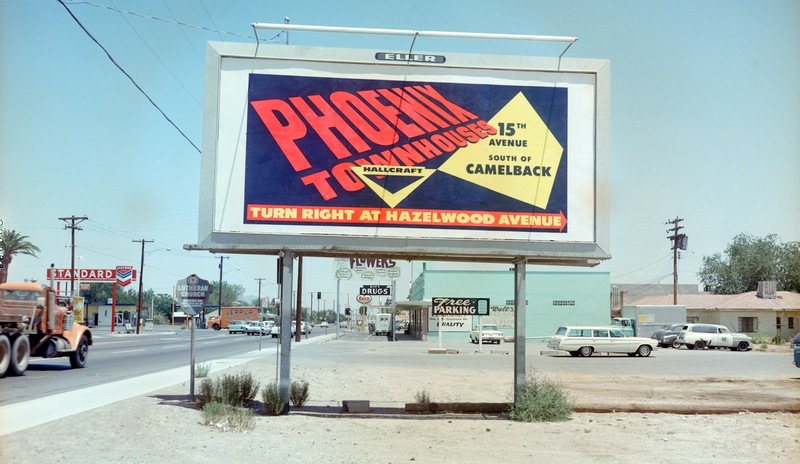 It's actually a billboard from the 1960s in Phoenix, Arizona, that I found on a website that posts a lot of images of advertising. And sure, I'm interested in advertising (I'm an old Marketing guy), but mostly I'm interested in the background. For someone like me, there's so much to see in an image like this it's overwhelming. I see the cars, the buildings, the signs. I see the fonts, the colors, the textures. And this doesn't just happen to me when I'm looking at old images. I see it all of the time, wherever I go, even in real life. I look at backgrounds of movies. Many times when a movie ends, I have no idea what happened. This is especially true when I'm watching an animated movie. When I first started teaching Graphic Design, back in the '90s, I realized how unusual this type of behavior is with people. Most people look at whatever is directly in focus. Only the weird people look at what is called "negative space". And that just means whatever is in the composition that isn't the focus, like the characters, or in the case of the image above, the billboard. And once you start seeing backgrounds, it's amazing. But don't expect most people to understand. 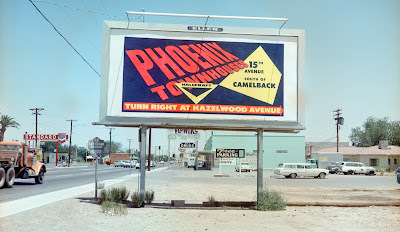 Image above: Looking east on Indian School School towards 19th Avenue in the 1960s, Phoenix, Arizona. And a billboard.